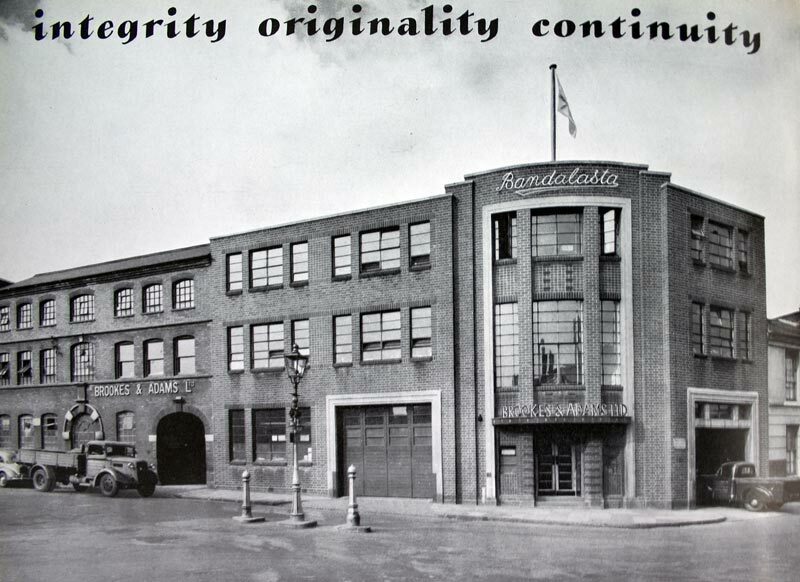 This section is for photographs of Bandalasta related items that are not to be found on the Catalogue page. Contains: 4 Teacups 195J, 4 Saucers 196J, 4 Plates 139J plus a silver plated teapot and stand, cream jug, sugar bowl, sugar spoon and 4 teaspoons. 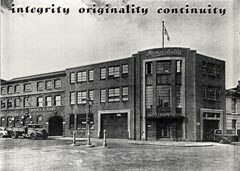 Produced by Kavin Silverware Ltd. St. Paul's Square, Birmingham 3. "Mummy has her Plated Tea Service when friends come to TEA - Why not You?". 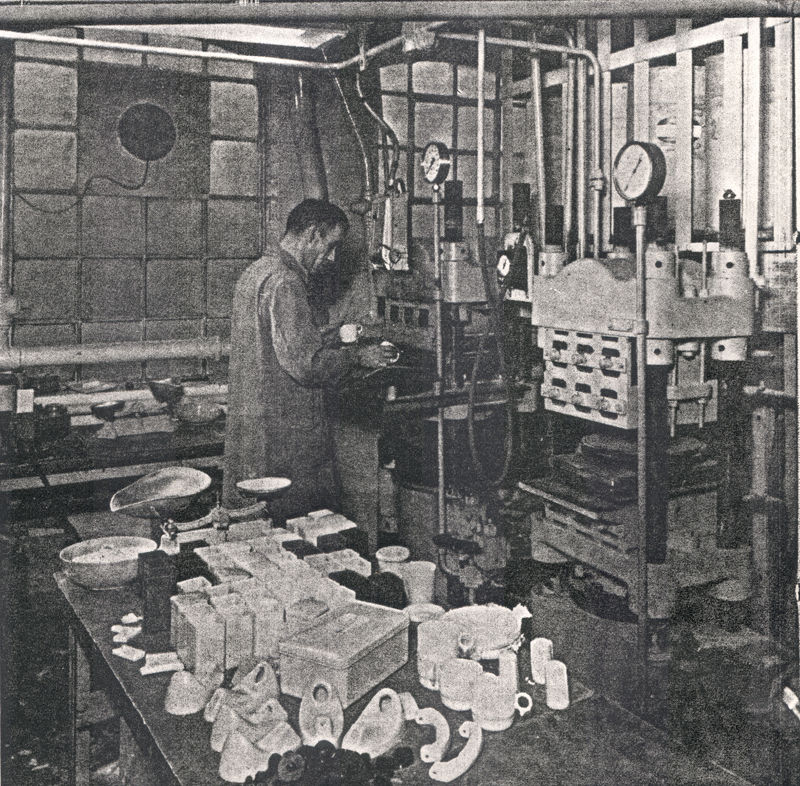 The set on the right is an example of how the various different makes of BEATL could easily be matched together. The Jug is a Bandalasta 172 - Jug, but the stand and the sugar bowl are both Linga Longa Ware. The items in this section have all been customised, in some way, by previous owners. The items in this section illustrate how highly valued these early plastic items must have been. 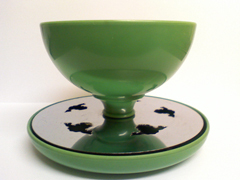 A BANDA WARE version of a 193 - Powder Bowl fitted with an E.P.N.S cigarette rest to convert it to an ashtray. 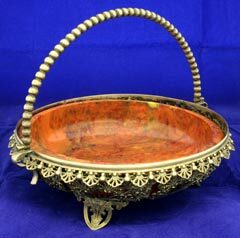 A 130 - Fruit or Rose Bowl fitted with curved metal side handles (possibly originally brass plated), and detachable base covered in metal (possibly pewter). A 106 - Floating Bowl sitting inside an intricate base metal holder. 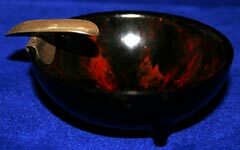 Difficult to tell if the holder was made for the bowl or whether it was just luck that the bowl fitted. 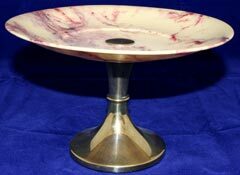 A 158 - Bread and Butter Plate converted into a cake stand with a base metal foot. 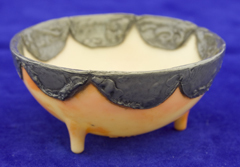 A 183 - Bowl fitted with a rather ornate pewter rim decorated with leaves and flowers. A set of 4, 165 - Beakers hand painted, in oils, with pictures of hunting scenes. 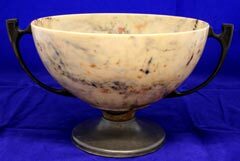 A 193 - Powder Bowl fitted with an ornate pewter rim. It's beginning to look as though these rimmed bowls may well have been retailed rather than just being personalised. A 204 - Grapefruit or Sundae dish with unusual chrome-plated metal insert. 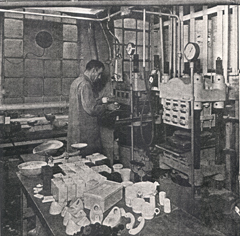 Brookes and Adams produced a number of commemorative items, some of which are illustrated below . 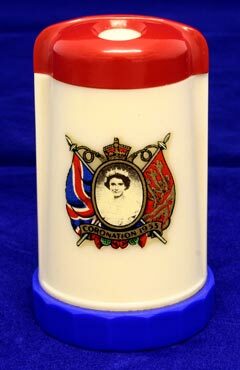 A 238 - Combined Salt and Pepper Pot, in red, white and blue, commemorating the coronation of Queen Elizabeth II in 1953. 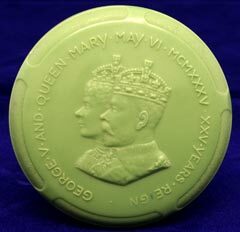 A 190J	- Childs Round Butter Pot with Lid commemorating the Silver Jubilee of George V and Queen Mary on May 6th, 1935. 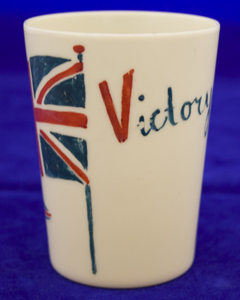 The 65 - Toothbrush Beaker, illustrated on the left, commemorates the end of WWII (1945). Whether or not this was a commercially available item, or a personally customised one, we are not sure. The flag and text are clearly hand-painted. Incidentally, this is the first and only 65 - Beaker we have seen. It is very, very similar to a 165 - Drinking Horn or Beaker!! 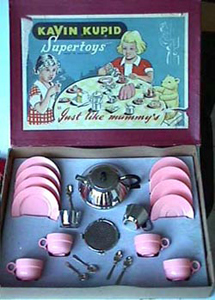 The D3-Dolls Tea Set illustrated on the right commemorates the Silver Jubilee of George and Mary. The tray is inscribed "George V and Queen Mary, May VI, MCMXXV, XXV Years Reign". For more pictures see the D3/D7 catalogue entry. Special thanks to Jean Sanderson. This section contains examples of BANDALASTA items made as promotional items for other companies. 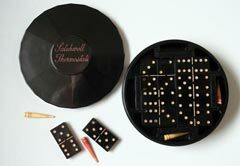 253 - Dominoes, produced for Satchwell Thermostats. Note the small scoring pegs - could these be the smallest pieces of Bandalasta ever produced? This section is reserved for photographs of the People and Places associated with the design, manufacture and sales of BANDALASTA.